Mercy Multiplied’s Founder and President, Nancy Alcorn, baptized ten residents from the Nashville Mercy home on Sunday, March 12th. The residents were baptized at Christ Church in Nashville, where they attend weekly services and Sunday school during their time at Mercy. Following a time of worship, Christ Church Pastor Shawne Brown invited the Mercy residents to the platform to introduce themselves. Brown had attended Mercy’s MPower Workshop, a workshop to equip helpers, the week prior and said it was unbelievable. As each young woman shared her name, the congregation cheered and then encouraged the residents by extending their hands in prayer over the group. Nitz led the church in worship with Phil Wickham’s “This is Amazing Grace.” As the words sang out, “You lay down Your life, that I would be set free. 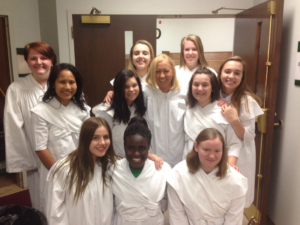 Oh Jesus, I sing for all that You’ve done for me,” the girls proceeded into the baptismal tank where Nancy was waiting to baptize each one. Click here to view the full service, including baptisms, in the Christ Church video archive. Mercy is grateful for the support of Christ Church and the “church home” provided to the Nashville Mercy residents as they learn and grow in their faith.